If you live in an area prone to floods, have a finished basement or live near a wet area, a sump pump may be a wise investment. Sump pumps work to help keep water out of your lower level before it can flood and cause widespread damage. A sump pump is a small pump sunk into the ground of the basement or lowest level of the house. It is used to pump water up and out of the basement before it can cause damage to the home. The water is frequently directed to an area outside the home where it can be safely carried away, such as a storm drain, dry well or sewer system. A channel is dug around the perimeter of the home, just outside the edge of the basement. This channel is usually part of a full, basement waterproofing system and directs any water that may enter the building to the pit where the sump pump resides. When water inside the dug pit reaches a pre-determined level, the pump automatically switches on, pumping the water out of the pit and sending it through a hose or pipe to the outdoors. Not every home requires a sump pump, and digging the channel and pit needed to install one can be a pricey endeavor if you do not. For those who do need one, however, it can save you thousands in repairs. If water has found its way into your home once before, you can rest assured that it will find its way in again. Even if there was no prior history of flooding before the first flood, if water has managed to penetrate, you need a sump pump, preferably either near where the water entered, or with a channel near the entry site that directs to the sump pit. If the water table outside your home is higher than the basement, then you may be at risk for future flooding, or for moisture problems in the basement. As part of your basement's waterproofing, a sump pump can help to channel and direct any moisture that enters, sending it back out where it belongs. If the ground around your home becomes waterlogged during storms, a sump pump can help drain away some of this excess water before it has a chance to do damage to your home's foundation. Special channels can be dug that will help the pump eliminate this water. Some homes using a water filtration system due to well water or poor city water may benefit from a sump pump to help flush the water system. Water filters automatically flush themselves approximately every two weeks. This water needs to be directed outside, where it can collect harmlessly. If a sump pump is available, this can help get the water safely outdoors and away from the house. If you decide you need a sump pump in your home, you have a few options to choose from. If your basement is unfinished, and you don't think the pump would be needed on a regular basis, consider getting a pedestal style pump. Pedestal pumps keep the motor up high on a pedestal and are ideal for very small sump pits that can't handle larger versions. They are cheaper than submersible models, but will still get the job done if needed. 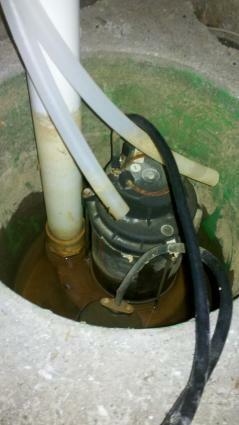 Submersible sump pumps are larger and enclose the motor inside the pump. They are meant to sit inside the sump pit, so they are quieter, less obtrusive and able to handle larger volumes of water. They cost more than pedestals, but will last more than twice as long and can handle frequent use. If you live in an area that frequently experiences power outages during storms, consider a backup or battery powered sump pump. Battery powered models are not designed for regular use, but will automatically turn on if the power fails, allowing your home to stay dry no matter what the situation. There are three types of switches to consider in your pump. All three go on automatically when water is sensed, but they work in different ways. Capacitive switches use microprocessors to "sense" the water and turn on the pump. They never wear out because there are no mechanical parts. Vertical switches are mechanical and turn on the pump once water reaches a pre-set level. They are not adjustable, however, so if the amount of water entering the home ever changes, they may go out of use. Diaphragm switches use water pressure inside the pit to turn on the pump. These mechanical switches are sensitive and adjustable, and will shut off once the water pressure inside the pit drops. If you live in an area with frequent rain or have a home with a moisture problem in the basement, protect your belongings with a sump pump. Once installed, a properly set pump can bring lasting peace of mind.